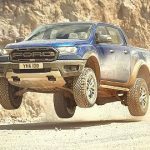 This article will cover the 1983-1997 Ford Ranger and all the Ford Bronco II’s. The average conversion time on most vehicles is 50-70 hours. The cost varies depending on what parts you use. It is recommended that you use the 5.0L (302) V-8 for your conversion. It is possible to install the 5.8L (351W) especially with a body lift, but the 5.8L is taller and a little wider than a 5.0L (302). Both the 5.0L and 5.8L engine will have valve cover clearance problems with the heater box. There is also a potential clearance problems with the 351W exhaust manifold and steering linkage. You can choose between the fuel injected and carbureted engines. The 302 is only about one hundred pounds heavier than the four cylinder engines installed in Rangers from the factory. This is important because as engine weight is increased, the ride height lowers in the front and this produces extreme negative camber at the front wheels. Some people have asked about using 4.6L V-8’s. The 4.6L is much wider and taller than a 302 or 351W. See the chart below for width comparisons. The 429 and 460 can be installed in a Ranger, although this is not a very practical swap. The big blocks length complicates installation and makes clearance in certain areas very tight. 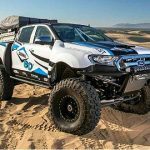 The stock Ranger/Bronco II chassis isn’t capable of handling the torque of the large displacement motor and this adds to problems. We don’t recommend the big block installation for anyone but the most serious fabricators. 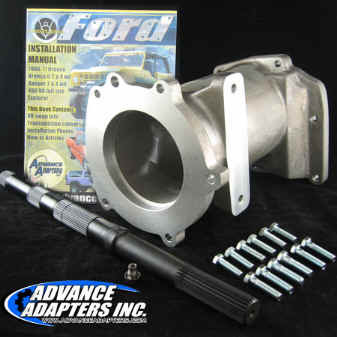 The Advance Adapters 2WD mounts (713015A) work with the factory Ford rubber V8 mounts Part NO. E4TZ-6038G or Advance Adapters Part NO. 713017. 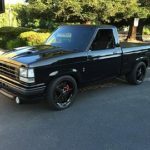 It has been said in our forums that a 1985-1993 Ford Mustang Convertible 5.0L engine mount will work for this conversion. Swap the mounts to opposite sides (Left-Right). The convertible engine mounts and hardtop engine mounts are not the same. The 5.0L Ford Mustang Convertible was actually built on a 4-cylinder Mustang chassis. The 1994-1995 Ford Mustang GT uses the same engine mount. We’ve been telling people how to do this for years, and you really are probably better off buying the stock Mustang Convertible mounts, but there is a way to make your own. Ranger motor mounts consist of a rubber pad with a stud sticking out of each side. One stud goes through the frame and has a nut which screws on the back to attach it to the frame. The other stud sticks straight up and attaches to a motor bracket. Four cylinder motor mounts are usually hydraulically filled and are weaker than the V6 mounts, which are a solid rubber mount. Whenever possible, use the V6 mounts. 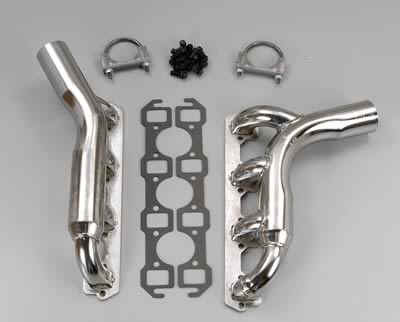 These are used on 2.9L and 4.0L Rangers. Fabricate two new brackets from 1/4-inch plate steel to bolt onto the side of the V8 motor at the motor mount bosses. This isn’t as difficult as it might sound. These brackets are just pieces of 1/4 inch steel with two holes drilled through them so that they can bolt to the block, and then two more holes, one for the motor mount stud, the other for the alignment pin which also sticks up from the motor mount. Trial fit everything once and when the motor is in the position you want, take a few measurements and make the motor mount plates. They’re flat pieces of steel with no bends or curves. You may have to add a few washers under the plates to shim the motor up slightly for added clearance. Now it’s time to situate the motor into the chassis. Were assuming your transmission is already installed. There are several points during engine installation where clearance will be rather tight and modifications will be necessary. If the engine isn’t bolted to the transmission, bolt it up now. Assuming the transmission is located properly, let it locate the motor, forward to rearward, in the chassis. Now locate the engine properly, left and right. At this point no accessories should be on the front of the motor, and installation will be easier without the water pump attached. Leaving the water pump off while installing the engine will allow it to go in more smoothly and may save several dents in the radiator support. Don’t install the radiator yet, or you’ll be sending it out to have several holes repaired. The motor should be close to centered, left to right, between the frame rails. It may be necessary to locate the motor slightly to the passenger side for oil filter adapter to steering sector clearance, and steering to exhaust manifold clearance. If you bought a conversion kit with motor mounts, it probably has measurements to tell you where to mount the engine mounts to the crossmember. For a V-8 swap using a carburetor, I recommend using an early to mid 1970’s Duraspark II ignition. Try to find a V-8 from this era with the distributor and ignition still intact. It has a wiring harness that goes from the module on the wheel well to the distributor, and the original power harness from the Ranger should plug right into it. I use an MSD ignition with my DurasparkII distributor. It hooks up easily following the directions that come with the new ignition module. I keep the original Duraspark II ignition module installed on the fender liner so that I can hook it up if the MSD should fail. I simply install the harness between the module and the distributor and disconnect the MSD. If you choose to use a fuel injected 5.0L you’ll need the computer and harness for the engine. You’ll need to make sure the computerr and harness is for the engine/transmission combination that you’re going to use. If you use a manual transmission then you’ll need to use a computer and harness from a manual transmission set up. The best thing you could do is go to a salvage yard and get an engine transmission combination and buy the whole setup – computer, harness and all. Mark the connections with masking tape with either letters or numbers so that you can match up the connections later. It also helps to go to a parts store and get the Haynes manual for the vehicle the engine came out of. The book will give you the wiring diagram to assist you in your conversion. Ford Motorsports offers wiring harnesses for fuel injected engine swaps. CLICK HERE for a 5.0L Wiring harness diagrams. If you want to retain a mechanical fuel pump, you’ll need one from a 1970-1973 Ford Econoline van with power steering. It’s a Carter pump that’s made upside down to clear the steering box. Otherwise, a mechanical fuel pump will need to be replaced by an electric unit to clear the steering box. The fuel pump will need to deliver 5-7 psi. If your Ranger has an electric pump in the gas tank it has a 40-psi rating. You will have to either replace it or add a fuel regulator to reduce it to 5-7 psi.. When adding an electric fuel pump you should install a switch in the cab so that you can shut the fuel off in an emergency. I would also recommend going to a salvage yard and obtain an inertia switch from the trunk of a newer vehicle and wiring it in with the fuel pump. This will shut the pump of during a collision. Your stock pump in the tank on fuel injected models will work with the 5.0 fuel injection. Stock carburetors work OK on an off-road truck. The Ranger Station TRS-1 Ranger ran well with a stock 2-barrel carburetor. Once an Edelbrock 4-barrel carburetor was added it ran very poorly on steep angles. Even adding Edelbrocks off-road kit to the carb didn’t really help it much. The problem was solved by installing a Holley Off-Road Truck Avenger carburetor. The truck can now sit a steep angles and idle fine. You will have to use an adapter and move the oil filter for clearance. The adapter will have to point down instead of out for clearance. You’ll need Advance Adapters P/N 716084. Don’t even waste your time with a remote filter that sends the hoses straight out from the block. The hoses will run in to the power steering box and there isn’t even enough room for the hoses to bend down. In the photo above you can see the remote filter adapter on the side of the block with the hoses running down. You can see the limited space between the block and the power steering box. The first consideration is the oil pan on your engine. Ford engines of the 1960’s and 1970’s generally used front sump oil pans. These will not fit the Ranger/Bronco II chassis properly. 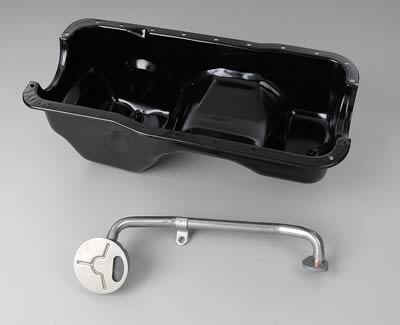 Instead, a rear sump or dual sump oil pan must be used. Rear sump oil pans are originally used on full-sized trucks and Econoline vans and hold (6) quarts of oil. They are the preferred oil pan as the extra quart of oil is of somewhat of an advantage for performance and off-road applications. The other choice is a dual sump oil pan. These are easy to spot because they literally have two sumps, one at the front and another at the rear with a drain plug on each. The front sump is for clearance to the oil pump and the rear sump is the reservoir for the oil. The biggest advantage to the dual sump pans is that the engine may be situated about half an inch lower in the chassis. Please note, 1980’s Crown Victoria police cars are the only vehicles with a 351W that use the dual sump oil pan. If you need the dual sump pan for a 351W, you’ll have to find one from a police car or order one for that application. The problem with exhaust manifolds is having enough clearance between the engine and frame rail. The nice thing about the 1970’s exhaust manifolds is that they don’t have any downward flanges that might point the exhaust in to the frame rail. An exhaust shop will easily be able to plumb an exhaust system that will clear the frame rail and firewall. 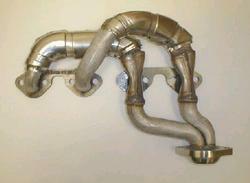 This is what the stock 1970’s Ford exhaust manifold looks like installed in a Ranger. 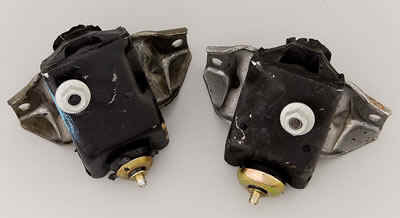 You can use your stock power steering pump by using the correct V8 brackets found on most Ford cars between 1978-1986. You need the correct V8 pulley for proper belt alignment. Original length hoses can be used on most conversions. The valve covers will not clear the heater box on a V8 swap. Many people cut out the corner of the box and patch it up to seal it. A better way is to heat it up and reshape it. The plastic that the heater box is made from is some kind of styrene and responds well to heat. Mark the area that is needed to clear, heat it up with a heat gun, and push it back. An oil filter is the right size for ‘forming’ the heater box for clearance. You can use a factory V6 Ranger alternator with a V8 bracket and adjuster. The alternator-mounting bracket is part # E7TZ-10A313-B and the adjusting bracket is E6AZ-2888-A. The stock power steering pump can be used on a V8 with the correct brackets found on many Ford passenger cars. The power steering bracket is part number E7TZ-3C511-A. You can use your original temperature and pressure gauge but will have to re-calibrate your factory tachometer. Contact Specmo Enterprises (810-398-9103) about recalibrations. You can use your air conditioning with the proper V-8 brackets. The wiring will need to be extended and the condenser will have to be relocated to the front side of the radiator. 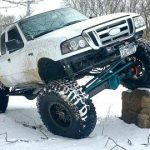 Radiator – There have been many members of The Ranger Station forums that have used the stock 4.0L radiator successfully with a small block Ford V8. If your Ranger doesn’t have a 4.0L in it now, look for a radiator from a 1991-1994 Ford Explorer which is a direct bolt in. The 1995+ Explorer radiator will require modifications to the core support to get it to fit. The only issue that the stock radiator may raise is clearance. Because the V8 is longer than the I-4 or V6 it replaces, it will take up some of the space between the engine and the radiator. Not all Ford water pumps are the same depth. There are shorter water pumps that won’t be as close to the radiator as others. Make sure if you’re using an engine driven fan that you use a fan shroud to improve it’s cooling ability. Advance adapters offers a replacement radiator for your V8 swap:. 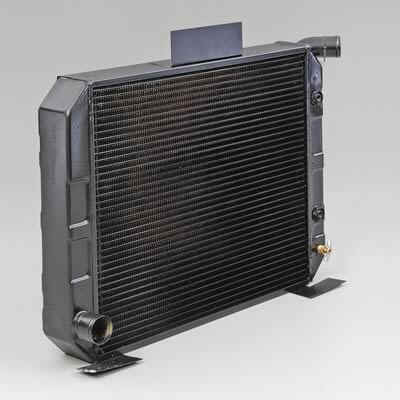 Summit Racing carries radiators from Griffin and AFCO that are designed for these swaps. While some people feel the Ford Explorer 5.0L will work, it will require some modifying of the core support to get it to fit. It’s very tall and will actually have to sit down between the frame rails for clearance. Fan – You may be able to use a mechanical fan and still have 1 to 1-1/2 inches of space between the fan and radiator. If you get the radiator tucked in under the radiator core support you will have a few more inches for fan clearance. If using a mechanical fan, remember to use a shroud. The shroud will greatly improve the fans ability too cool. If you choose to use an electric fan you should use the biggest one that will fit on the radiator. Mount it on the engine side if there is enough room and use it as a puller fan. I would recommend two 12-inch fans so that the electric fan motor will not be directly in front of the water pump. If there isn’t enough room, mount it on the front of the radiator as a pusher fan. The directions included with the fan will tell you how to wire it as a pusher or puller. You should use a fan rated at least 1200 CFM. Advance Adapters suggests a minimum of 950 CFM. The stock water pump places the pulley close to the radiator. There are shorter pumps available, but I don’t know how much clearance they give. You might want to use one and still use an electric fan for plenty of clearance. Remember that everything flexes while off-road. The first is a short pump for “V” belt drives. Will fit 289/302/351W drivers side outlet and provides approx. 1-1/2″ of additional clearance (Part# FOR-M-8501-E351). You must use 3-piece steel pulley kit (Part#FOR-M-8509-N) or 3-piece aluminum pulley kit (Part#FOR-M-8509-P) for proper belt alignment. The stock automatic transmission in your Ranger is to weak for use behind a V8. They have a hard enough time surviving behind the V6. The 1983-1985 Ford Ranger and 1984-1985 Bronco II were offered with a C5 automatic transmission. If you have one, or can find one, consider yourself lucky. You can swap a V8 bellhousing and torque converter from a C4 on and bolt a small block V8 to it. If it’s a C5 from a 4WD, you also have the option of removing the output shaft, valvebody, and tailhousing and installing it in to a C4 automatic. Most Rangers use an A4LD automatic overdrive transmission. If you have an overdrive automatic in a Ranger or Bronco II it’s an A4LD. There is no bell housing available to install a V8 to this transmission, and even if you could, these transmissions had durability concerns with the torque from a V6, so a V8 would probably destroy an A4LD in a short period of time. This is something you should seriously think long and hard about. The most popular automatic transmission used in a V8 swap is the Ford C4 3-speed automatic. On some transmissions, such as the C4, Ford has used a variety of bellhousings, flywheels, and starters over the years. Whenever you have a choice, use the smallest diameter flywheel and bellhousing available to you to install the V8 into your Ranger. The bellhousing bolts are already extremely tight to the firewall. You do need to use the correct starter and flywheel for the bellhousing your using, regardless of which transmission you choose to install. Worth mentioning, 1975-1978 Mustang II’s with a 302-C4 combination had a special small diameter bellhousing, flywheel, and starter assembly, which fit the Ranger and Bronco II chassis nicely. 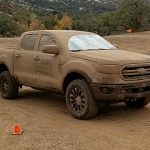 2WD – If your Ranger was originally equipped with a 4-speed manual transmission and is a 2-wheel drive, a C4 will bolt right into the chassis with the 4-speed transmission mount and cross member. The existing drive shaft will be the correct length as well, but will require a different yoke for a C4 or C5 to install it in your new transmission. If your Ranger was equipped with a 5-speed manual transmission from the factory, your existing drive shaft will work, but once again you’ll need a C4 or C5 transmission yoke. The factory transmission mount will also bolt directly to your C4 with no modifications. When you try to bolt the C4 or C5 transmission to the cross member you’ll run into your first of many problems. The cross member is further rearward on the chassis on a vehicle originally equipped with a 5-speed. You have two choices for the cross member. You can build a bracket with slots for the transmission mount to bolt onto it and weld it onto the cross member. This bracket is welded to the factory cross member to allow the transmission mount to be moved a few inches forward from where it originally was located. The other choice is to remove the frame brackets for the transmission cross member and relocate them a few inches forward of where they were located. 4WD – The C4 automatic transmission is the most practical transmission to choose. It is durable and very easy to find. Due to design changes, you should select a 1970 or newer C4. The C4 has a removable bellhousing, so make sure the bellhousing pattern is compatible with the new engine and flexplate. It is recommended that you use a 157 tooth flexplate. Be sure the starter motor engages the flexplate correctly with this bellhousing. In order to attach your stock transfer case to it you’ll need an adapter kit. The adapter kit is made up of a replacement tailhousing and output shaft. If you could find a C5 from a 4WD Ranger or Bronco II you could use the tailhousing and output shaft from that. Advance Adapters carries (3) different conversion kits for the C4. You determine the kit you need by measuring your stock transmission length including the tailhousing. The you choose a kit that will give you the same overall length (O.A.L) as your stock setup. C4: The C4 is 17″ long. Combined with the new adapter length, use the best adapter suited for your application. P/N 50-8400 – C4 to Borg Warner 1350 T/C. Adapter length of 6.812″ O.A.L. 23.812″. P/N 50-8401 – C4 to Borg Warner 1350 T/C. Adapter length of 11.5″ O.A.L. 28.500″. P/N 50-8402 – C4 to Borg Warner 1350 T/C. Adapter length of 8.75″ O.A.L. 25.750″. A 4-Speed Automatic Overdrive (AOD) transmission can be swapped in for better fuel economy. If your vehicle didn’t originally come with an A4LD overdrive automatic or Mitsubishi 5-speed, driveshaft modifications will be necessary. When installing this transmission with a small block V8 you’ll need to use an engine control computer originally matched with an AOD. The AOD is 20-1/2″ long. Combined with the new adapter length, use the best adapter suited for your application. There are early and late versions of this transmission, These kits come with a modified AOD output shaft, a new transfer case adapter and necessary hardware. The adapter housings have provisions for the stock rubber crossmember mount and the stock linkage (some applications may require linkage modification to fit our adapter). P/N 50-8403 – AOD (up to 1987) to Borg Warner 1350 T/C. Adapter length of 9″ O.A.L. 29.500″. P/N 50-8404 – AOD (1988 & up) to Borg Warner 1350 T/C. Adapter length of 9″ O.A.L. 29.500″. P/N 50-8405 – AOD (1988 & up) to Borg Warner 1350 T/C. Adapter length of 5″ O.A.L. 25.500″. 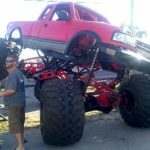 You will need to modify your driveshafts, crossmember and linkage for these swaps since the transmission lengths vary. Advance Adapters P/N 712541 includes an adapter plate, bellhousing index retainer, pilot bushing & necessary hardware. This adapter plate bolts to the front of the stock manual transmission. This allows a standard Ford V-8 bellhousing to be mounted to your stock transmission. 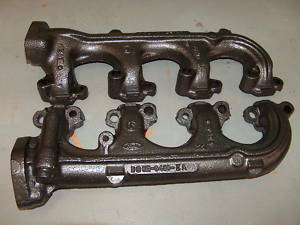 It is best to obtain a 1984-1987 F-150 bellhousing. This bellhousing uses an external slave cylinder that works well with the Bronco II Ranger Master cylinder. 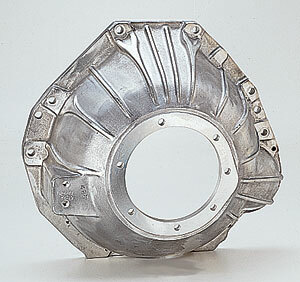 This bellhousing was only used with the 164 tooth flywheel. This will cause problems with tunnel clearance. A body lift is recommended. The 4 & 5 speed transmissions will need slight modifications to the input shaft pilot tip, clutch splines & stock release bearing retainer. These modifications are listed in your instruction sheet. Modifications: Using a hacksaw blade in each groove, make sure the new clutch disk slides freely on the original transmission input shaft. The tip of the original input shaft will need to be shortened so that it is flush with the face of the bellhousing. The new pilot bearing that is supplied with Kit No. 712541 must be installed into the new V-8 engine crank. Make sure the seal in the new pilot bearing is facing outward towards the clutch. This will prevent the grease from entering the clutch area. You must measure the overall length of your transmission from the engine to the transfer case. Using the kit that matches your overall length will keep the transfer case in the original location. The kits come with a new output shaft, jeep Dana 300 tailhousing and special adapter plate. The new shaft and adapter housings are compatible with your World Class transmission. The transmission shaft IS NOT COMPATIBLE with the regular T5 transmission. In order to bolt this 5 speed to the new 5.0 liter engine you must use the bellhousing from Mustang type vehicles. This bellhousing was only compatible with a mechanical type clutch control. You will need to use Advance Adapters internal hydraulic release bearing that will fit over the T5 bearing retainer. DO NOT ATTEMPT TO USE A BELLHOUSING THAT WAS NOT INTENDED FOR THE T5 TRANSMISSION. This particular bellhousing for the T5 has a special transmission index diameter and special length for exclusive use with the T5 transmission. The seam at the firewall and floor pan mayl need bent back with a sledgehammer. The floor pan may need some slight modification with a sledge hammer for clearance. A body lift over comes this problem. 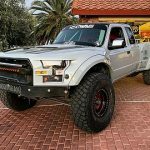 The adapters from Advance Adapters are generally for mating the Rangers transfer case to the new V8 transmission in order to keep the transfer case in it’s original position and to avoid driveshaft modifications. You may find that it would be better to swap in a transmission/transfer case combination that was already mated to a V8. A good example of this would be a C4 and a Dana20. This may however call for a new or modified transmission crossmember. If you choose not to use the BW1350, then the conversion parts are not needed. Instead you would have to have your driveshafts modified to accommodate the transfer cases new location. The Ranger would benefit from having a new (larger in diameter) driveshaft made to handle the power of the V8. Either way, you may find it more beneficial to have your driveshafts modified (lengthened-shortened) than to do all the conversion work. It may also be cheaper in the end. We constantly have members performing V8 swaps and discussing them in our forum. Check out our V8 Conversion Forum HERE. Note: This is an overview of V-8 conversions. You should consult Advance Adapters for detailed instructions. You can contact them at 1-800-350-2223. Check your local emission laws before performing this swap.